I’m taking part in a European City Carnival with a group of fellow bloggers. Each of us is highlighting a different European city which we’ve enjoyed visiting with our families. We’re each creating a post about our chosen city, and linking up with each other’s posts. 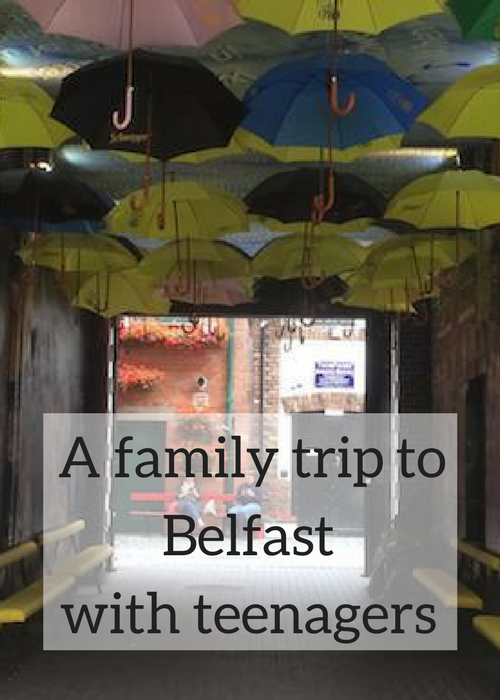 I’m writing about Belfast, which I visited last summer with my daughter, who was 17 at the time. We both really enjoyed our short break in Northern Ireland, especially the time which we spent in the capital, Belfast. These are our Belfast highlights. 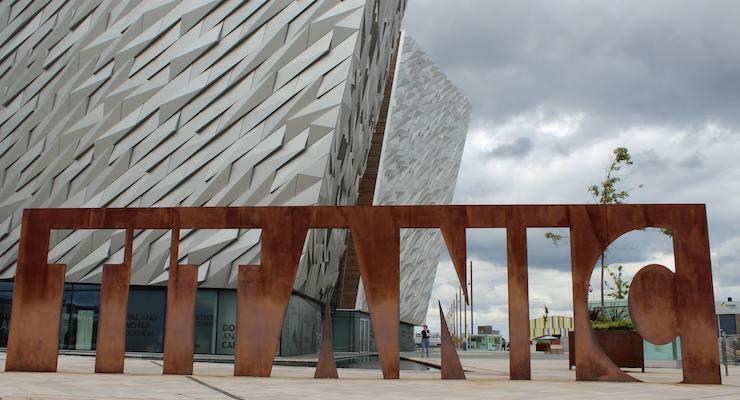 This is Belfast’s most popular visitor attraction, and deservedly so. The exhibition is in a building at the docks where the famous ship was built. More than 1500 people died when the Titanic sank on its maiden voyage, and this immersive exhibition tells the story of the ship and its crew and passengers. If you don’t have much time in a new city, a bus tour is a great way to get an overview. We enjoyed our trip on a City Sightseeing Bus, and would definitely recommend it. The local guide explained some of the city’s history as we went along, and we stopped at various points along the way, including at the Stormont parliament building, the political murals on Shanklin Road and Falls Road, and the Peace Wall which divides Catholic and Protestant areas of the city. This is a beautiful historical area to explore on foot in the city centre. We enjoyed seeing the quirky street art, especially around the Duke of York pub. This fascinating museum is outside the city centre, but worth a visit if you have time. The Folk Museum section houses a collection of historical Ulster buildings which have been rescued and recreated here. There’s a variety of buildings on display, including a school house, a sweet shop and some farm cottages, and you can go inside them to explore. The Transport Museum part has a wide range of historical exhibits, including steam trains, horse-drawn carriages and vintage cars. We were lucky enough to stay at one of Northern Ireland’s top hotels on our trip, as I’d been invited to review the five-star Culloden Estate and Spa. 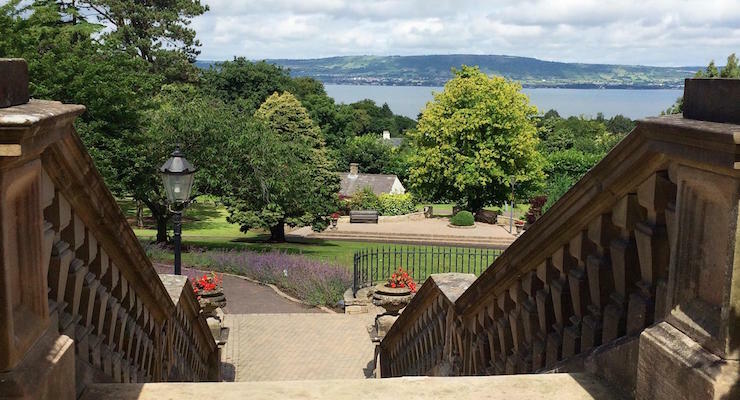 It was all very luxurious and relaxing, in a traditional country house kind of way, and I loved the hotel’s scenic location above Belfast Lough. Do pop over to read these European city posts by some of my fellow bloggers. Daisy at Dais Like These Family Travel Blog shares her tips on how to keep kids entertained during 24 hours in Bruges, Belgium. Joanne and her eldest take you on a tour of Brussels, Belgium and show you the essential stuff to do there, as well as what to eat and where to stay. Check out POD Travels if you’re planning to visit Berlin. Charly shares her top 30 places to visit in Berlin with kids as well as places which you can explore without them. With posts on the Berlin Wall, East Side Gallery and Wall Museum, a round up of the top Christmas markets in the city and a look at the Berlin street art scene, there’s more than enough to keep you occupied. Emma from A Bavarian Sojourn is well qualified to recommend a family trip to Munich, having recently moved from the city after living there for five years. She says that Munich is surprisingly child-friendly, and really does have something for everyone. Check out Emma’s list of things to do and see in Munich. Ting from My Travel Monkey spent a week exploring snow-covered Iceland and discovered a great range of things to see and do in Reykyavik – even for young children. Over on Space in Your Case Penny features Bologna, one of Italy’s foodie capitals. Bologna has lots to keep children entertained, as Penny discovered on a weekend break there. The Wandermust Family are big fans of Rome, and think that it’s the perfect destination for a European city break for families. Find out their top six reasons why, over on their blog. Lisa from Travel Loving Family shares her five must-see sights in the capital of Madeira, Funchal. Her recommendations include a scenic cable car ride to a panoramic view point at 1,800 feet, an exciting toboggan ride in a wicker basket and a visit to Blandy’s Wine Lodge to sample the famous Madeira wine. Penny from Parentshaped shares a treasure hunt in Amsterdam, a city which is packed with invitations to play and new things to discover and learn as a family. Nell Heshram is revisiting Oslo, one of her favourite cities, this summer. On her blog the Pigeon Pair and Me she’s put together a round-up of the top family-friendly museums in the Norwegian capital. Samantha from North East Family Fun has visited Barcelona many times with her three children. She recommends the Catalonian capital as a fantastic city to visit with kids in tow. Did you know that Barcelona is one of the few cities in the world with its very own beach? Find out why Samantha rates Barcelona so highly and recommends it as the perfect option for a family city break here. With three hundred days of sunshine, six theme parks and miles and miles of golden sandy beaches, Jane Batt from Taking recommends Benidorm for family holidays. Pop over to Taking 5 for Jane’s recommendations on what to do and where to stay in the Spanish city. 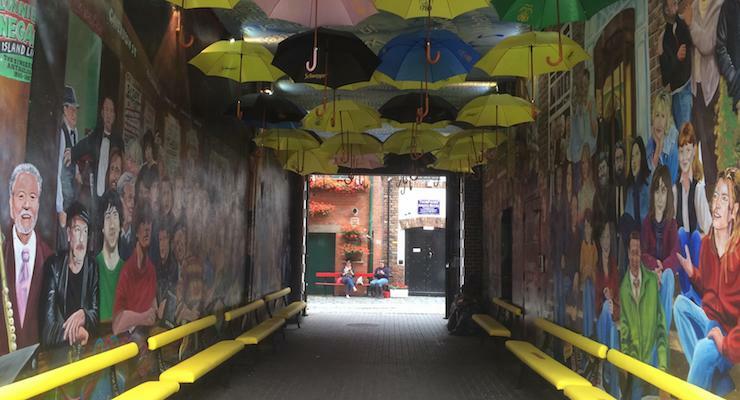 If you’re planning to visit the UK during your European break, Zena talks about why her family loved exploring Liverpool, and why it’s worth visiting if your looking for a vibrant and cultural city outside of London. If you’ve visited all of the best-known London sites and are looking for alternative things to do there, hop over to Like Love Do, where Donna shares 10 hidden gems in London. Which is your favourite European city for a family trip? Have any of these posts inspired you to visit somewhere new? Oh, wow! The places you went to are my travel destination dreams. Our family makes a trip once a year. Our plan is to go to places where culture is rich and sites are historical. Somewhere where our spirits will be renewed. Old cities, museums, castles and temples. I believe traveling lifts the spirit and soul. My teens imbibe it from me and would definitely pick Cambodia over Singapore. It sounds like you and your family have some great trips Dawn. I’d really like to visit the Ulster Folk Museum. That sounds like a real hands-on experience. Thanks for including my post!